Chris Martinez talks about working with newbie Kapamilya actors Enzo Pineda and Vin Abrenica. 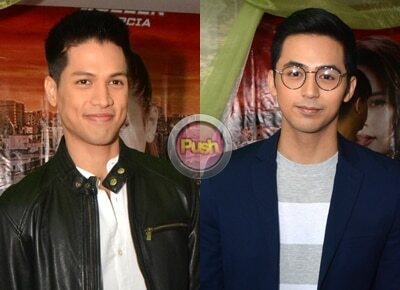 Aside from being the first Star Cinema offering for 2017, the movie Extra Service is Enzo Pineda’s and Vin Abrenica’s first project with the ABS-CBN film production group. Elaborating on the men’s characters, he said that Enzo had fun as he plays the role of a mute person. “Actually mahirap kasi he has to be more animated,” he said, adding that he has to give stronger facial expressions as he has no lines. “Okay siya, game siya. Nag-enjoy lang siya saka excited siya. He knows that it’s a very great opportunity for him,” Direk Chris said, adding that Enzo is very thankful. As for Vin, he said that he will play the role of a cop-detective who observes the characters of the lead stars Arci Munoz, Coleen Garcia, and Jessy Mendiola. According to Direk Chris, while he already worked with Vin on a commercial before, he had to meet Enzo as he was not familiar with him at first. “Pinakilala nila sa akin si Enzo kasi hindi ako masyadong familiar sa kanya in a three-dimensional way. Nakikita ko lang siya sa Instagram pero hindi ko pa siya nakikita in person so I had to meet Enzo… At saka medyo iba ‘yung role ni Enzo so kailangan kong ikwento sa kanya kung ano ‘yung ineexpect ko from him,” he said, considering his role as a mute person and the movie’s comedic theme. Extra Service opens on January 11 in cinemas nationwide.